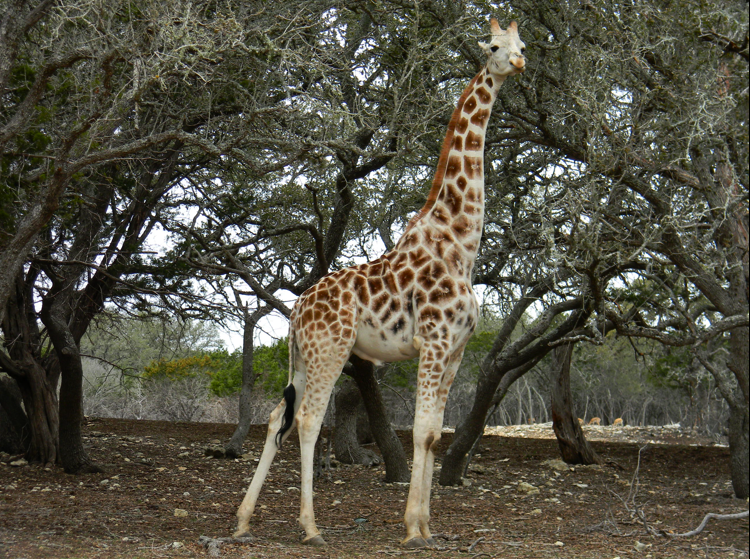 Update 4/10/12: Due to the recent LivingSocial deal, The Serengeti Resort has extended their weekend hours. The resort is currently open to the public Friday – Sunday, from 11 a.m. – 5 p.m. It is still recommended that you call to confirm before heading over there, as the resort will close early if there is a wedding scheduled. Also, the price for renting a golf cart has gone up to $50. Bags of animal feed are still $5. My husband and I celebrated our 14th wedding anniversary this weekend by trekking around the Hill Country, doing all sorts of things our children would have loved… without the children. We wanted to be the kids! 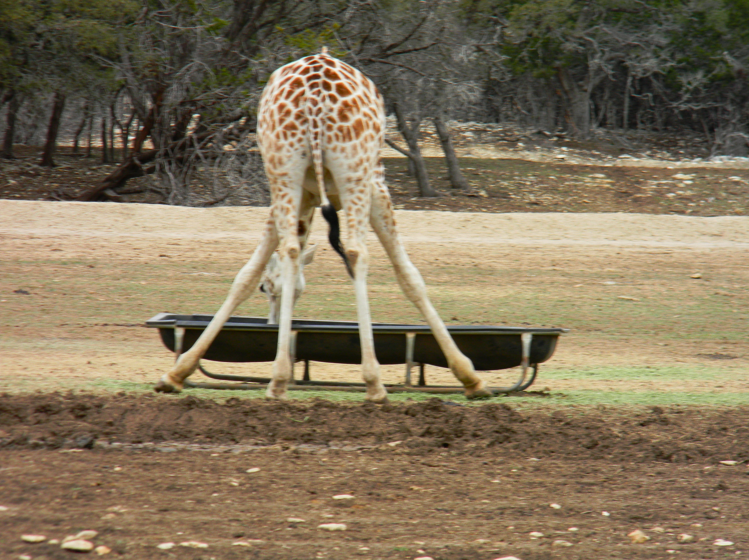 So, after strolling through Fredericksburg and climbing Enchanted Rock, we headed over to The Serengeti Resort in Bergheim. The Serengeti Resort is both a lodging destination, offering unique accommodation ranging from outfitter tents to luxury suites, and an events center. For us thrifty types, however, The Serengeti Resort is open to the public on Saturdays and Sundays, from noon to 5 p.m., when you can visit for free! 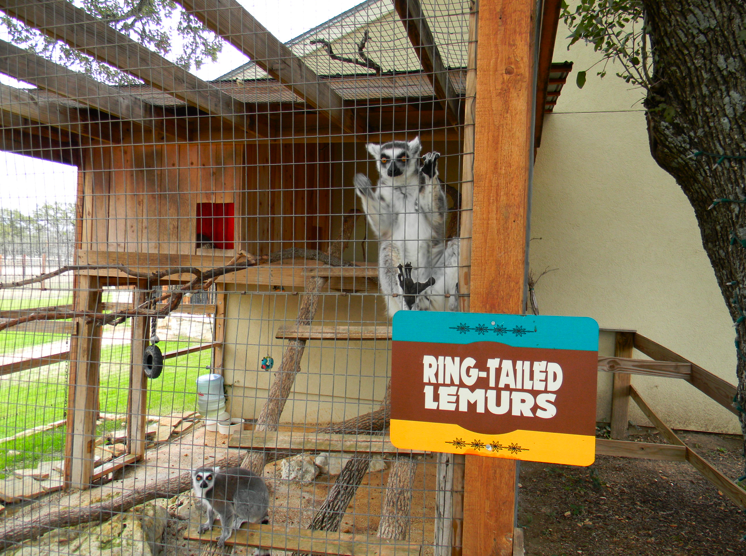 Bring a picnic, wander around the resort, and visit with the two cute ring-tailed lemurs and a few birds. 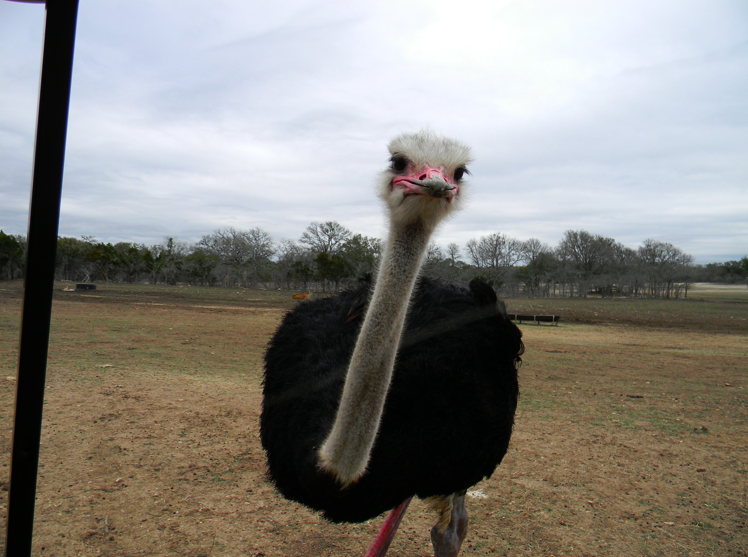 You can also feed ostriches through the fence, if you purchase a $5 bag of animal feed. There is a playground for children and adults can relax with a glass of wine or a beer. But once you see the exotic animals roaming beyond the ostriches, you are likely going to want to pay $40 to rent a golf cart. 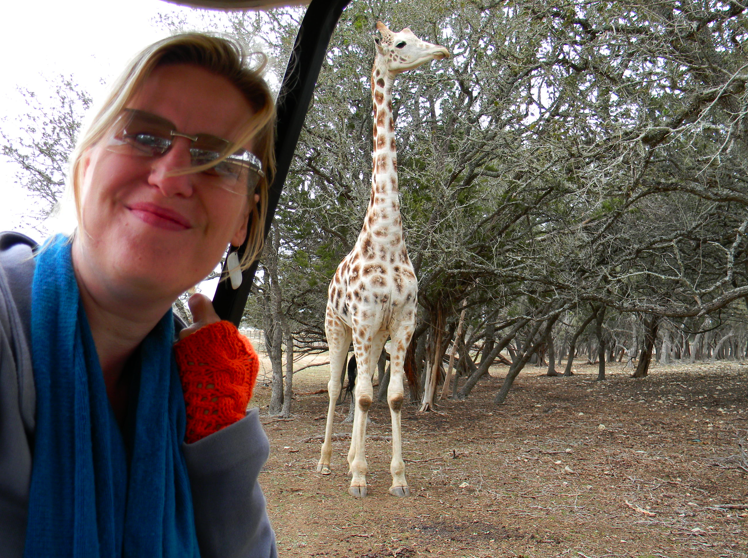 After signing a waiver, you can hop in the cart of your choice and embark on your very own Serengeti adventure tour! 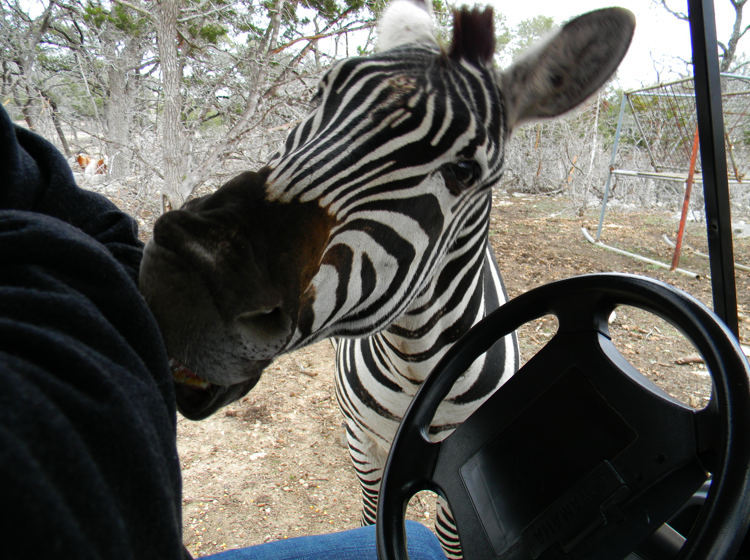 This is where you can drive right up to the animals (and coincidentally they can run right up to you). Moments after entering the enclosure, we were met beak to nose with a hungry ostrich. As he looked like he might climb in the cart with us, we started throwing food to distract him, and drove on. 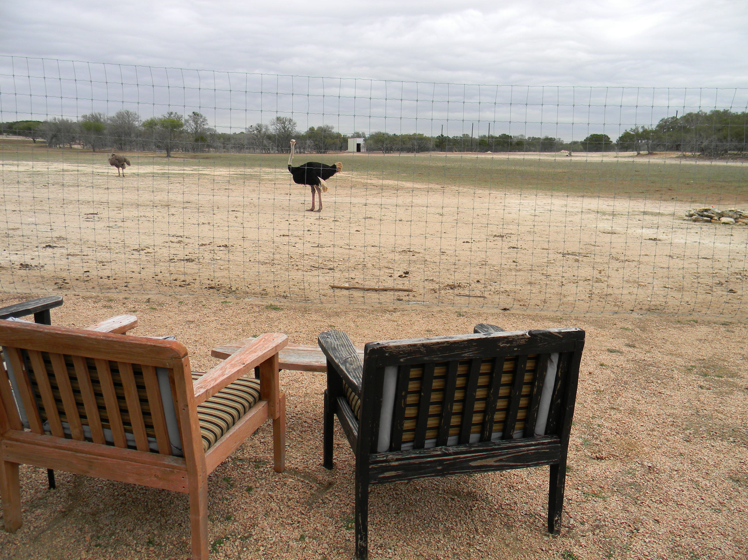 Although not nearly as expansive as the drive-through Natural Bridge Wildlife Ranch, The Serengeti Resort offers a much more intimate experience with the animals. 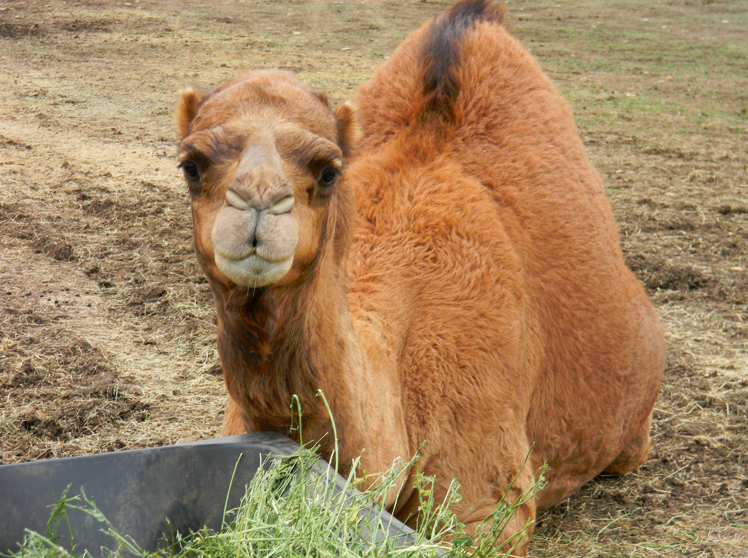 At the Ranch, you stop your car along the dirt road and hope the wildlife will approach, whereas at the Resort you can drive your little cart right up to the camel, the giraffe, and the zebra. Of course, when you are right next to an animal, you need to watch out for their teeth! 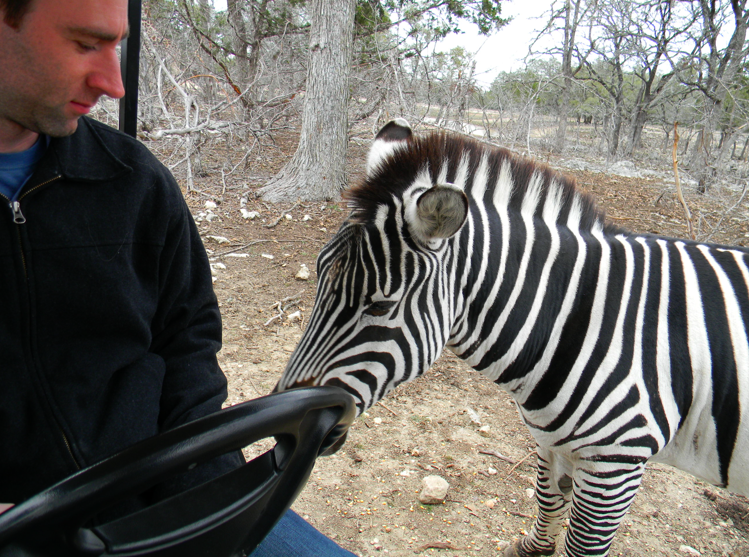 The zebra was not impressed with the amount we were feeding him, so he gave my coat a good chomp and then started to nibble on my husband’s arm. 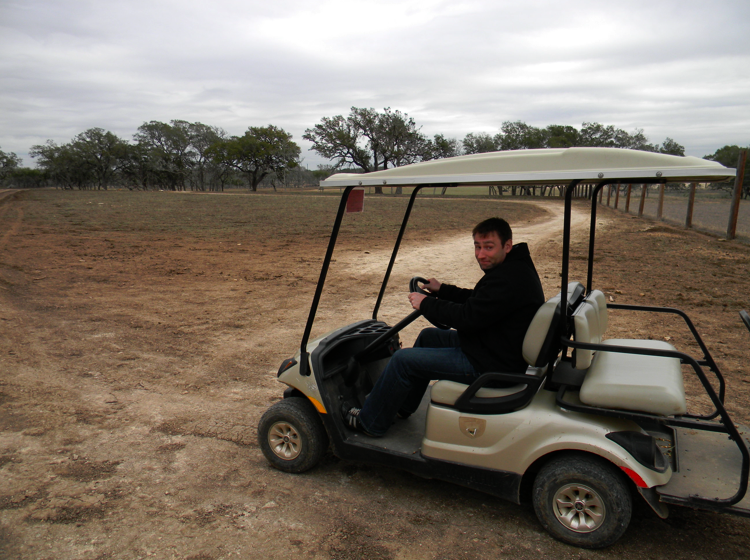 We only spent about 25 minutes tooling around in our golf cart, as the enclosure is not huge. But we did have a grand time outrunning the ostriches and trying to coerce the giraffe into eating from our hands (he was not convinced). If you’d like to visit, check out to The Serengeti Resort website for more information. Be sure to give them a call before heading over there, to confirm they will be open to the public when you’d like to go. It is possible they may close when hosting private events.